Performance alternative. 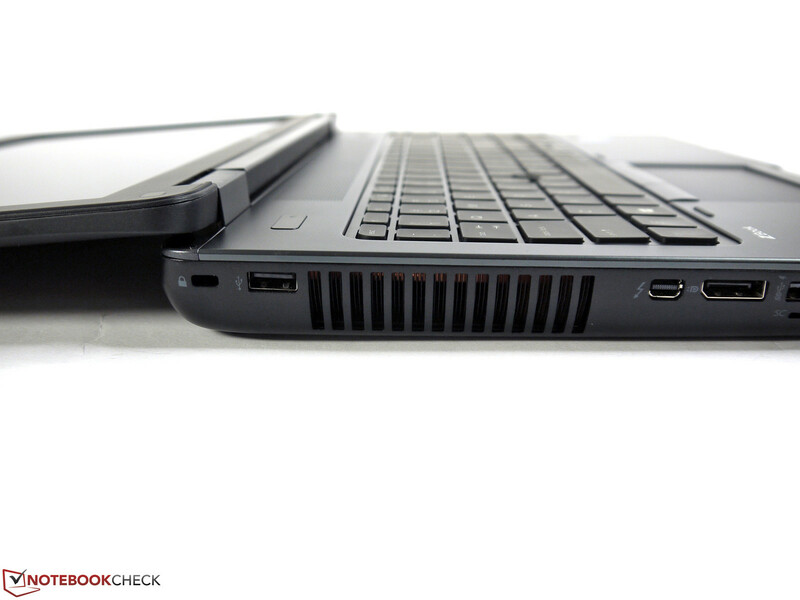 HP reworked its workstation series and now offers some new features. 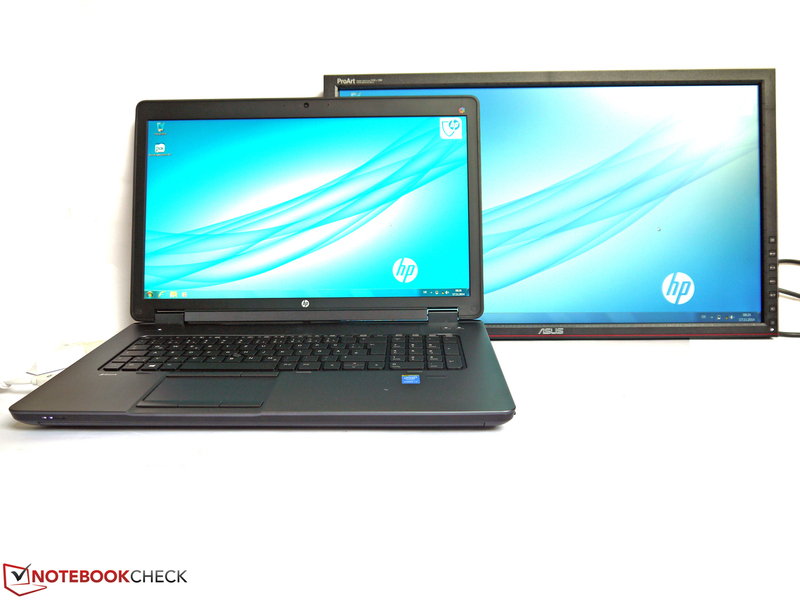 We decided to equip the HP ZBook 15 G2 with the AMD FirePro M5100 and the high-resolution QHD+ display. 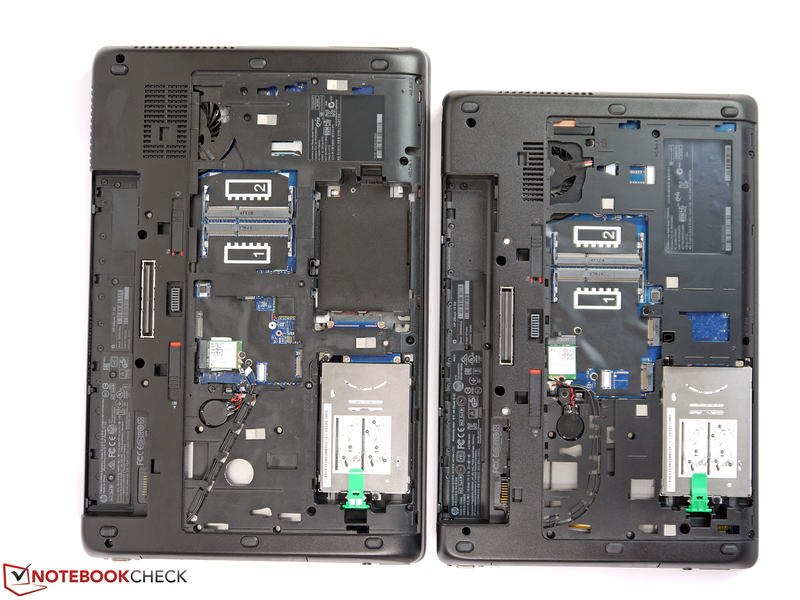 We tested how well the two components suit the established working device. 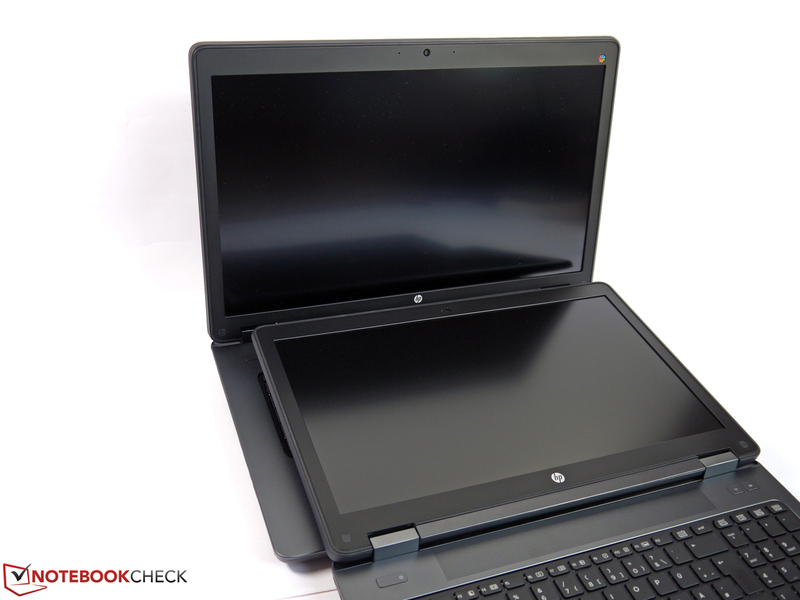 This is already the third version of the HP ZBook 15 in our editorial office. There are several reasons for that. First of all, the manufacturer runs very long product cycles for its mobile workstations and the possible configurations are so diverse that even those three reviews only allow a brief glimpse into the possibilities of the series. However, the main reasons for the current review update are the new components like the high-resolution QHD+ display and AMD's FirePro M5100 GPU. Nothing really changed in terms of the chassis, the port layout and the input devices, so we won't cover these unchanged sections. 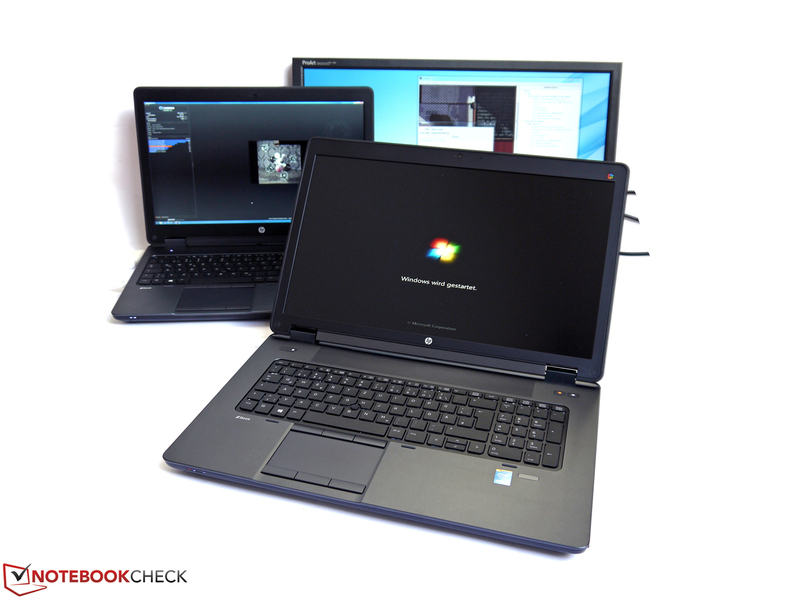 The according information is available in the main review of the HP ZBook 15 and additional information about features, for example, the DreamColor display, in the first review update. Our current review device is equipped with Intel's Core i7-4710MQ, 8 GB RAM, a 750 GB hard drive, AMD's professional FirePro M5100 GPU and a matte QHD+ display. The price of our review unit in HP's online configurator is currently around 2,600 Euros (~$3222, gross). A correspondingly pre-configured version is currently not available. 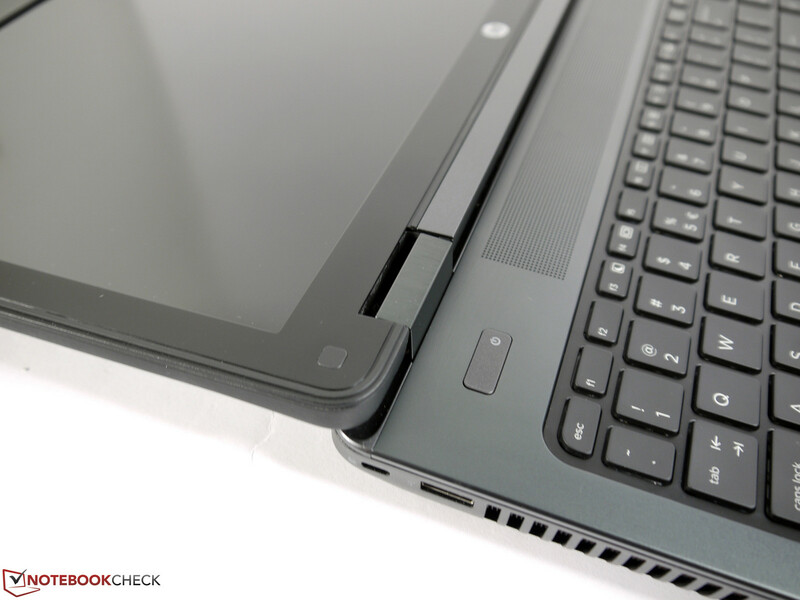 We already mentioned that HP expanded the choice of displays for the HP ZBook 15 G2 with a QHD+ panel. You can still get the Full HD TN panel (standard), the Full HD IPS panel (around 100 Euros more, ~$123) and the Full HD IPS DreamColor display (around 540 Euros more, ~$669). Our review unit uses the high-resolution QHD+ IPS display (around 330 Euros more, ~$409) with a resolution of 3200x1800 pixels and wide viewing angles. 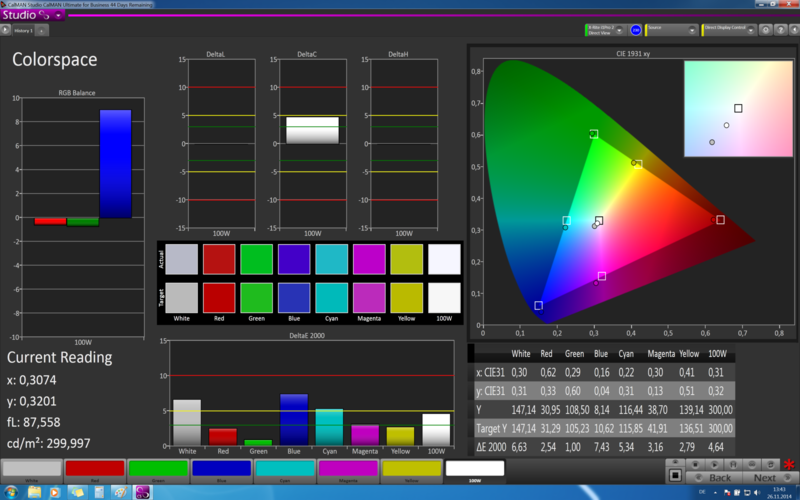 However, you don't get the very large color gamut that is provided by the DreamColor panel. The high resolution offers some advantages in return. You get a large working area and the presentation of display content is very fine. However, depending on the software, Windows can still have scaling issues at some points if you increase the size of fonts, icons and symbols. Menus can be too small, too big, not adjusted or overlapping. It also means some games can only be played in a window and not in fullscreen. Some software manufacturers still have some homework to do. Overall, the problems are smaller with every new software version, but it is still annoying if just the application that you always use is affected. As usual, we measure the brightness at nine different spots across the display surface. With a maximum brightness of 269 cd/m² up to 297 cd/m², the IPS display manages an average result of 279 cd/m² and a brightness distribution of 89%. You can see some screen bleeding at the display frame with dark pictures and some weak clouding in general. Besides the aesthetic effect, this limitation should not be an issue for most users in practice. 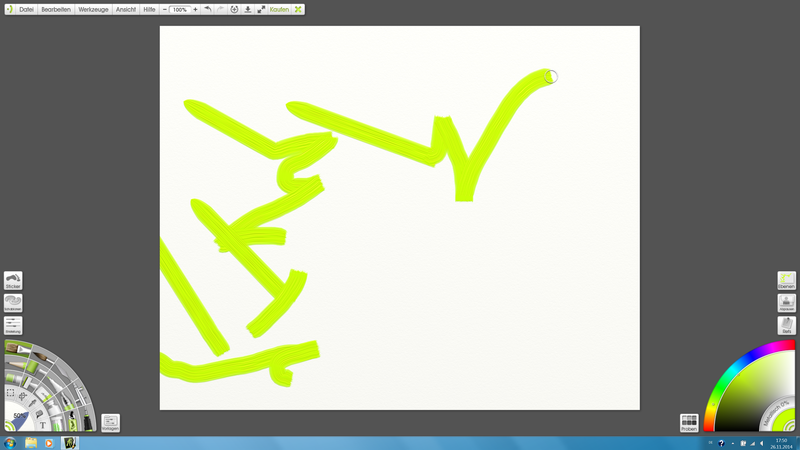 This could, however, be a problem for professional tasks, picture editing in particular. You can adjust the brightness in 20 fine steps from a minimum of 14 cd/m² up to the maximum setting. We measured a brightness of exactly 150 cd/m² in the center of the panel with step 16. We use this setting for some battery runtime measurements, but this value is also a very ergonomic setting indoors. Thanks to the matte surface we can hardly see any reflections. In combination with the high maximum brightness, this means it is pretty comfortable to use outdoors. You should still avoid direct sunlight, otherwise the picture will become very dark and you can hardly recognize it. 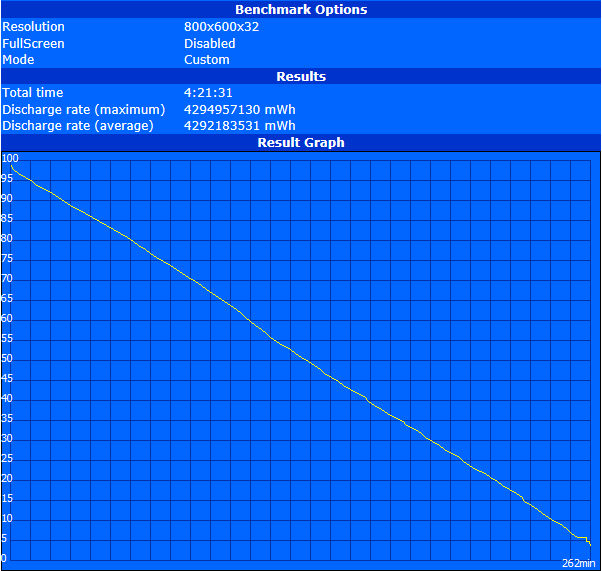 We did not notice a system-specific brightness reduction on battery power. The contrast reaches a very good value of 1,192:1, which results in a deep black and vivid colors. 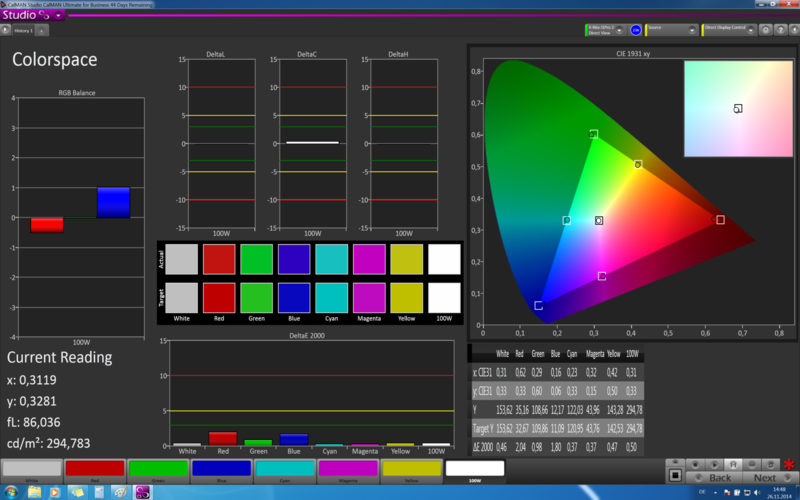 This is also supported by the pretty wide color gamut since the panel covers 82% of the sRGB color space. AdobeRGB, however, is only covered by 60%, which is a significant difference compared to the previously reviewed DreamColor display (95%) with RGB LEDs. 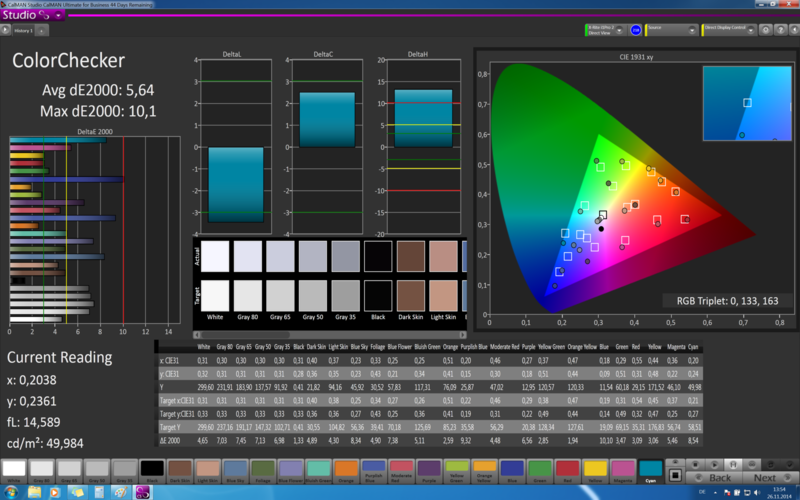 Here you will have to decide whether you prefer a very fine resolution or the wider color gamut. Both things together are, unfortunately, neither available at HP nor any other manufacturer at this time. The other measurements are already pretty good ex-works. Subjectively, the presentation is balanced and should therefore be suited for many scenarios. Users in the picture-editing business will probably calibrate the display anyway. The calibrated panel shows a very good potential with a very accurate presentation of the colors. The grayscale performance manages an excellent DeltaE 2000 deviation of 0.37, the RGB balance does not really show any problems and the gamma curve is almost perfect. 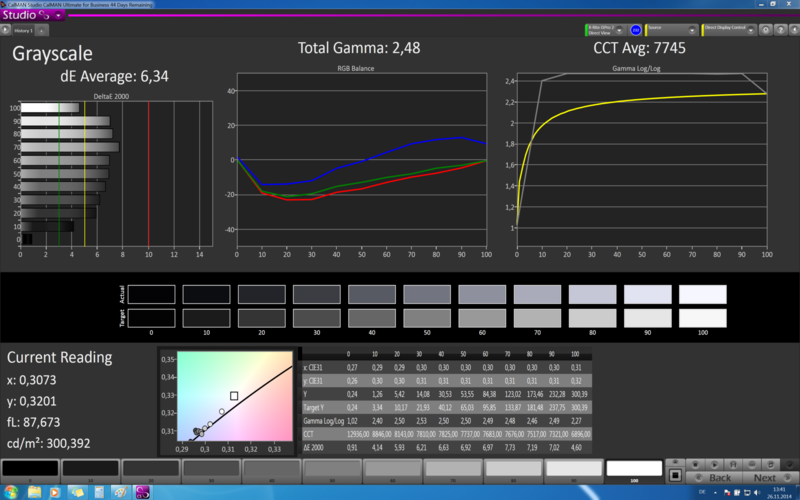 Calibration clearly improves the results for the primary colors with DeltaE 2000 deviations under 3. Blue and red show the biggest DeltaE 2000 deviations with 2.04 and 1.80, respectively, but they are still below the value where the human eye can see the difference. If the primary colors are good, the result cannot be bad for the ColorChecker, where the DeltaE 2000 value is sensationally low with 0.55. For the sake of completeness we want to mention that all saturation levels stay within their according target areas and don't reveal any issues. 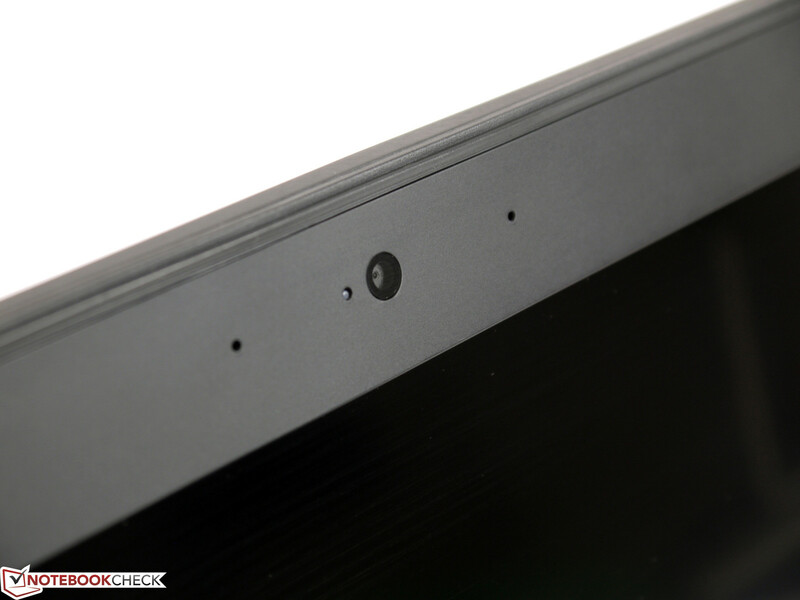 The overall viewing-angle stability is good and corresponds with the expectations of an IPS panel. You still have to live with some smaller color and brightness deviations from very wide viewing angles, for example, from an angle from below or above. The picture gets a bit darker in these cases and there is a yellow hue. Compared to TN panels, this is obviously complaining on a very high level, but it might be an important point of criticism for meticulous professionals. We already mentioned in the introduction that HP offers countless configurability options. Starting with an Intel Core i5-4340M all the way up to the Intel Core i7-4910MQ you can choose between five different CPUs. They can be combined with four different graphics cards: Besides the Nvidia Quadro K610M, K1100M and K2100M that were available so far, you can now get the AMD FirePro M5100 as well. The configurations are completed with up to 32 GB memory and different storage solutions, so there should be a suitable setup for every scenario. 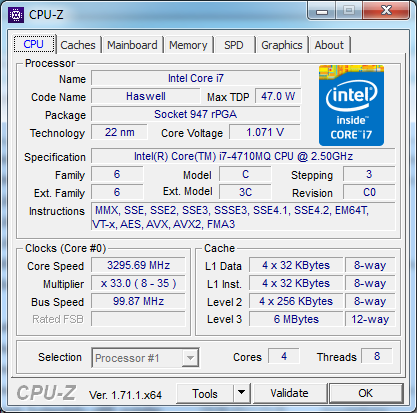 Intel's quad-core processor Core i7-4710MQ is used in many notebooks, which is a result of its good combination of performance and price. HP's online configurator actually lists the quad-core CPU for 62 Euros (~$76) less than the dual-core alternative Intel Core i5-4340M, which is pretty much an entry-level solution. Four cores that can execute up to eight threads simultaneously thanks to Hyper-Threading ensure a good distribution of the processing load in multi-thread optimized scenarios. 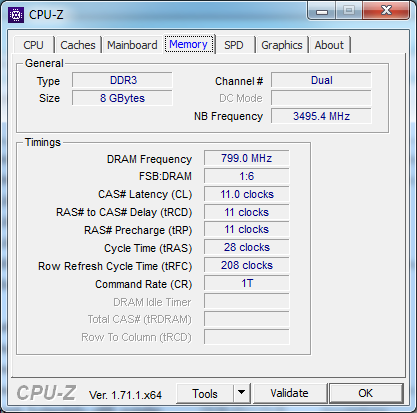 The maximum clock of 3.5 GHz also ensures a good performance when the software can only utilize one of the cores. 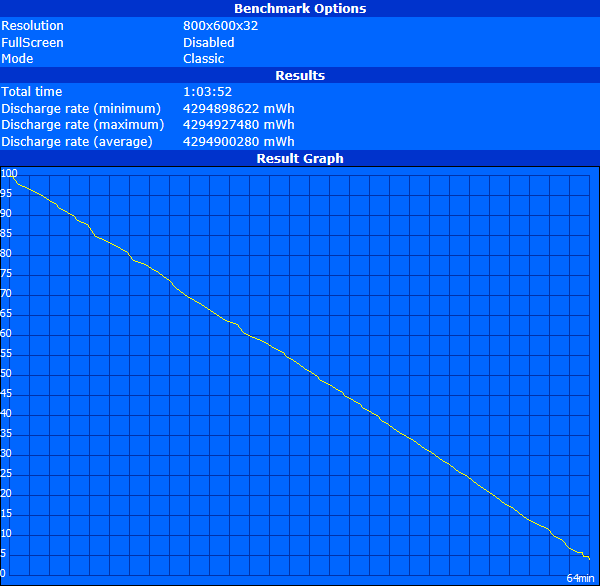 The benchmark results are on the expected level and confirm that this CPU is a convenient performance all-rounder. Cinebench R15 64-bit, for example, determines 651 points (multi) and 136 points (single), respectively. 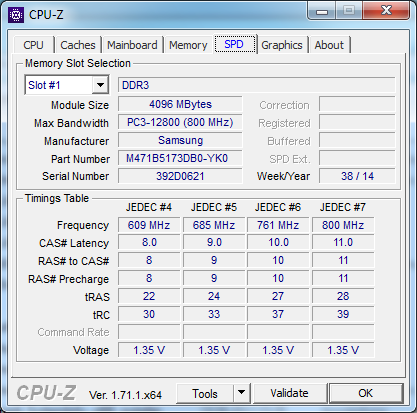 Under sustained load, the CPU reduces its clock from 3 GHz at the start to 2.5 - 2.6 GHz after 20 minutes. This value can be maintained even after two hours. 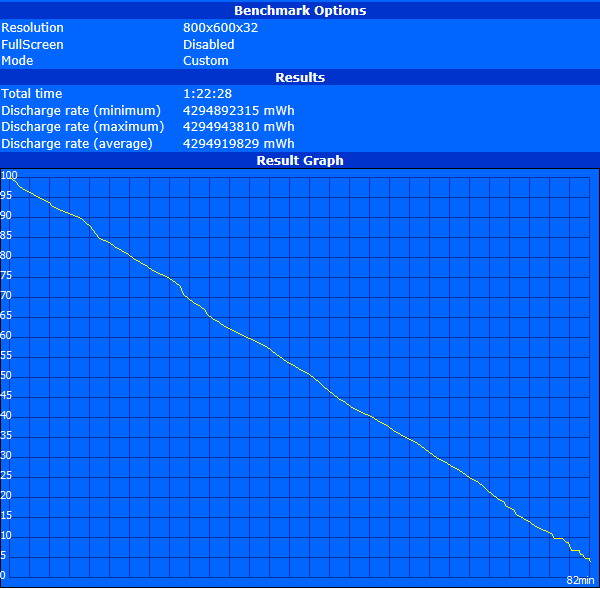 You have to live with a CPU performance drop of 20 up to 25% on battery power in general. 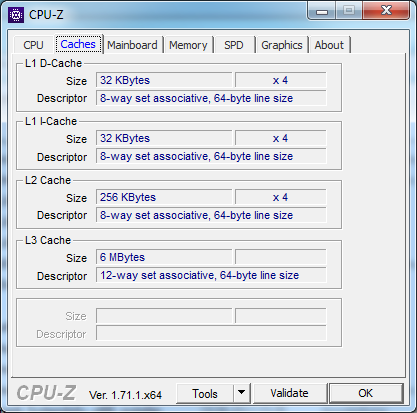 Cinebench R11.5 (64-bit, multi), for example, only determined 5.43 instead of 6.87 points. The mediocre system performance of our review unit is caused by the inexpensive entry-level configuration. It only uses a conventional hard drive with all the advantages and drawbacks. The slow access times and low transfer rates can be prevented with another model, during the configuration in the online configurator or by yourself after you purchase the device. The solution would be a fast Solid State Drive, which can be integrated as an M.2 drive or in the 2.5-inch bay (in this case it would replace the optical drive or the hard drive). Otherwise, the review unit is pretty well equipped and should be sufficient for many tasks. 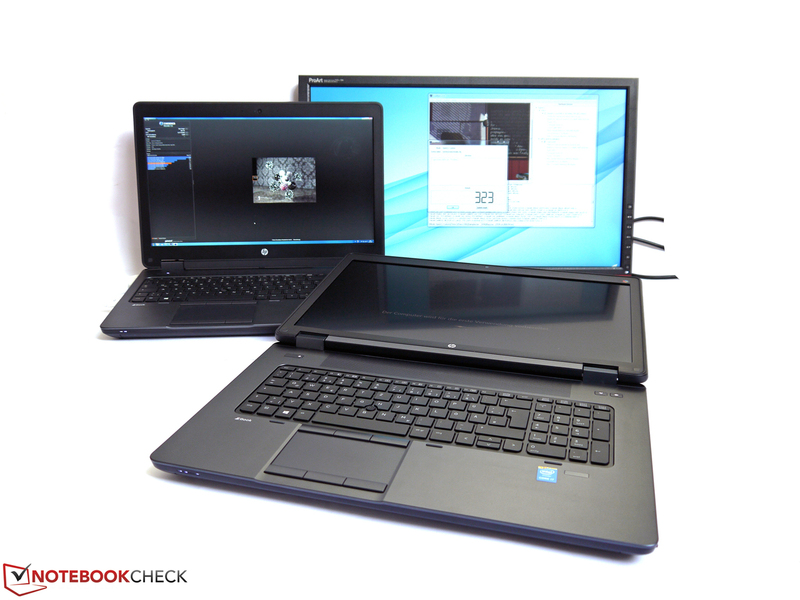 Our HP ZBook 15 G2 manages 3,314 points in the system benchmark PCMark 7 and 4,684 points in the Work test of PCMark 8. 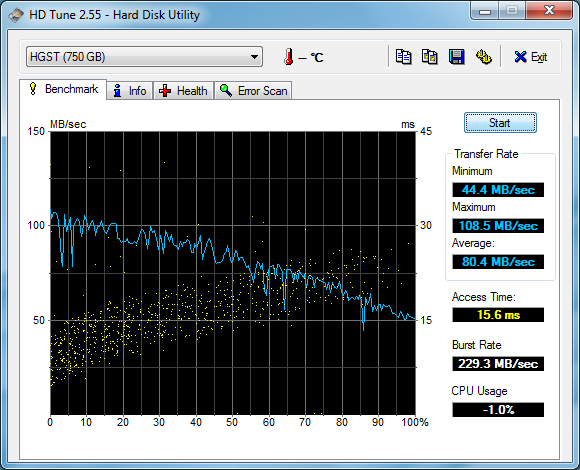 As mentioned in the System Performance section, the conventional hard drive is the bottleneck of the review configuration. The 750 GB Hitachi hard drive works with 5,400 rpm and reaches transfer rates of up to 108 MB/s. The access times are also longer than 15 ms. Arguments for the integration of such a storage solution would be the low price and the comparatively high capacity. If you can sacrifice a bit of both, then a Solid State Drive is the much faster alternative. You can either replace the existing hard drive or add an M.2 SSD. If you can waive the DVD burner, you can replace it with a modular bay and an integrated 2.5-inch drive as well. 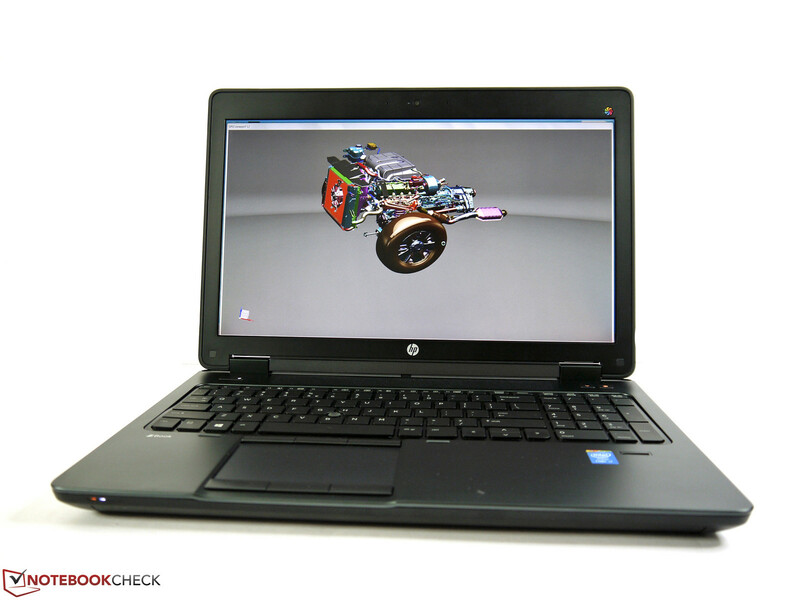 The revisited HP ZBook G2-series now also features graphics solutions from AMD. 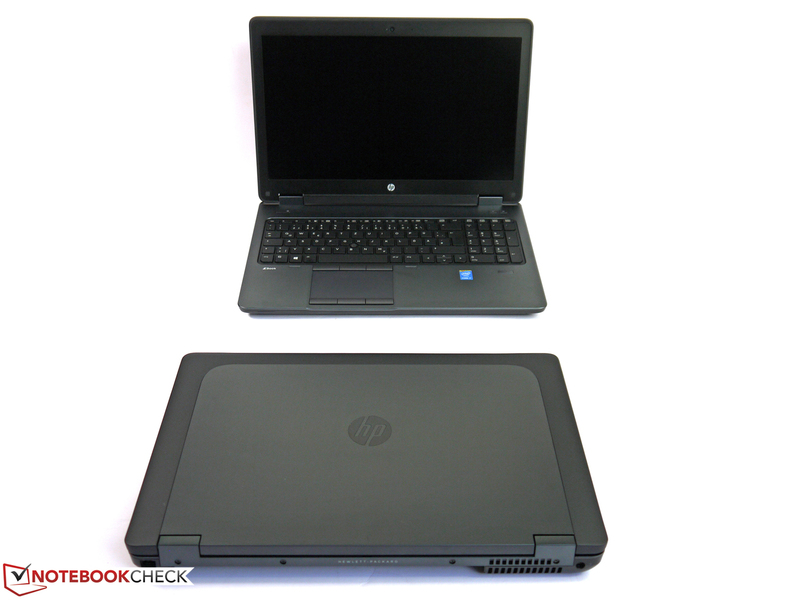 The HP ZBook 15 G2 uses the AMD FirePro M5100, which is an upper mainstream GPU. The dedicated GPU is principally complemented by the Intel HD Graphics 4600, which is integrated into the processor. However, the latter cannot drive the high resolution of the QHD+ display, so it is deactivated in our review configuration. The hardware of the AMD FirePro M5100 seems to be very similar to the AMD Radeon R9 M270 when we look at the specifications. The Cape Verde chip of our review unit is displayed as R9 M270x. It has 2 GB GDDR5 video memory, a 128-bit memory interface, 640 shader units and a clock of up to 775 MHz. Thanks to a special BIOS and optimized drivers the professional sibling of the consumer chip gets additional features. 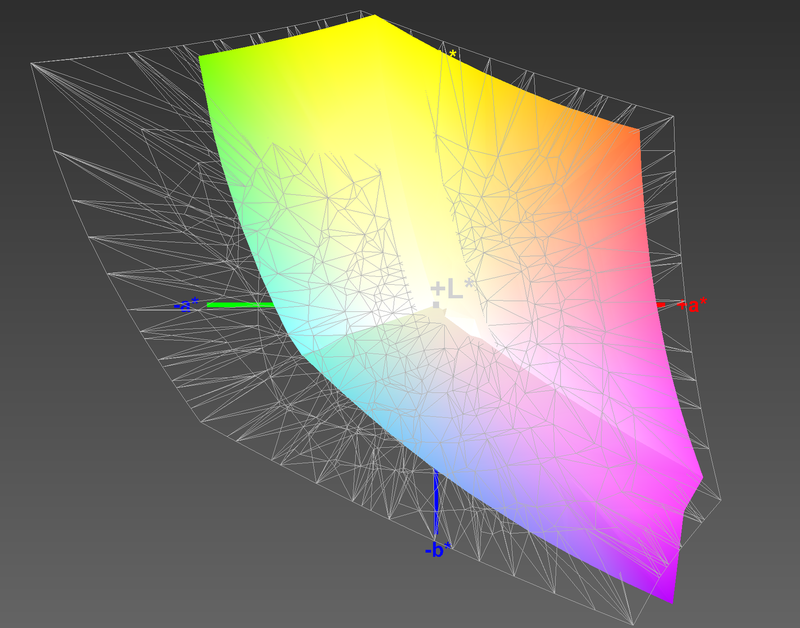 OpenGL-optimized applications in particular result in a significant performance increase. The stability in certified software is also supposed to be much better with FirePros compared to Radeons, an advantage that should not be underestimated in a working environment. In theory, the AMD FirePro M5100 can drive a total of 5 displays. AMD calls this technology Eyefinity. This means the user gets a lot of work space, which also improves the productivity in many areas. 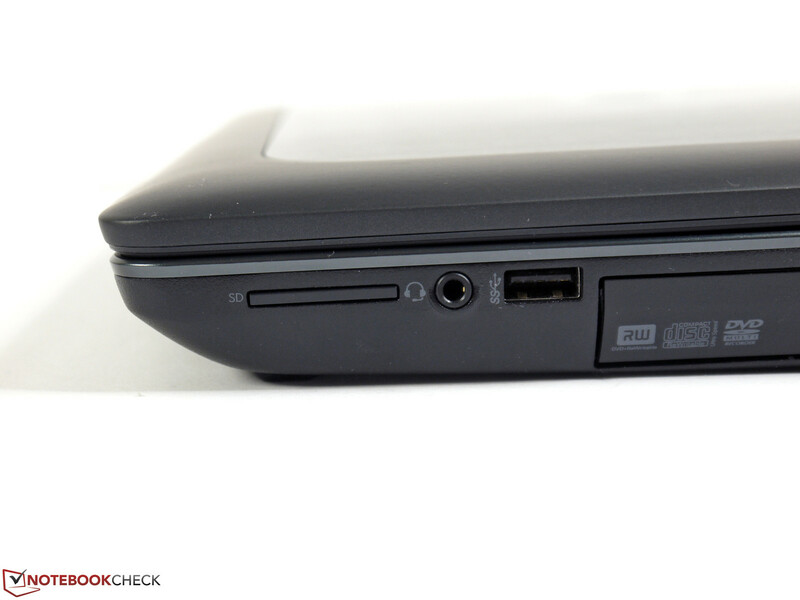 However, because of the limited ports, this does not really work in the case of the HP ZBook 15 G2 (up to 3 displays), but requires a corresponding docking solution. We did not test this feature. If you prefer to use just one display, then you can drive an external display with a maximum resolution of up to 4096x2160 pixels thanks to the integrated DisplayPort 1.2. This alternative also offers a lot of space on the desktop but reduces the number of cables and devices on the desk noticeably. 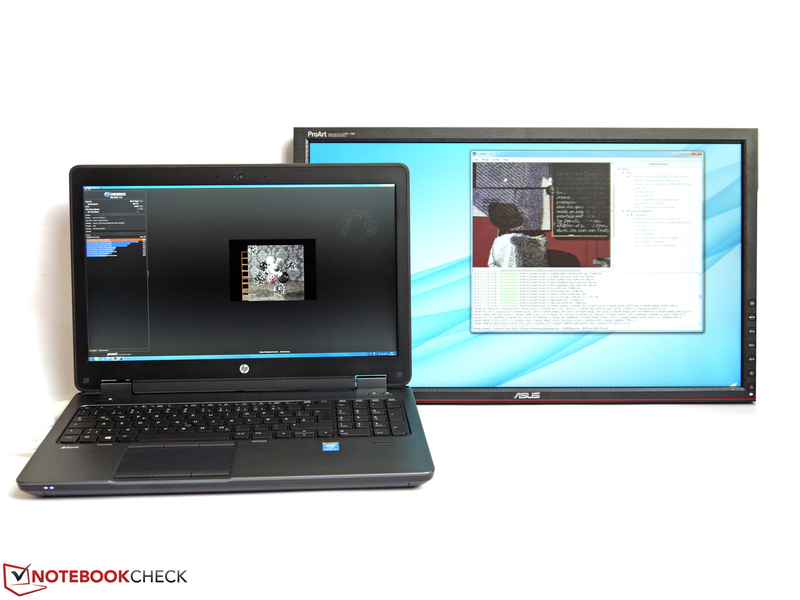 The benchmarks SPECviewperf.11 and 12 test the graphics chips in combination with several professional applications. These SPEC tests have the goal to simulate a realistic scenario and use view sets (3D construction models) that differ in complexity and already have a data volume of several hundred MB. Among others, frame models, shaded objects or very detailed objects with millions of triangulation points are being used. While SPECviewperf.11 only used OpenGL tests, SPECviewperf now also features a DirectX test (Showcase) for the first time. Professional environments require a high geometry performance, high stability, a low error rate and high reliability in particular, so professional GPUs have their own BIOS and special drivers. Those can work differently compared to their GeForce and Radeon counterparts and can, contrary to the consumer versions, execute special OpenGL commands. 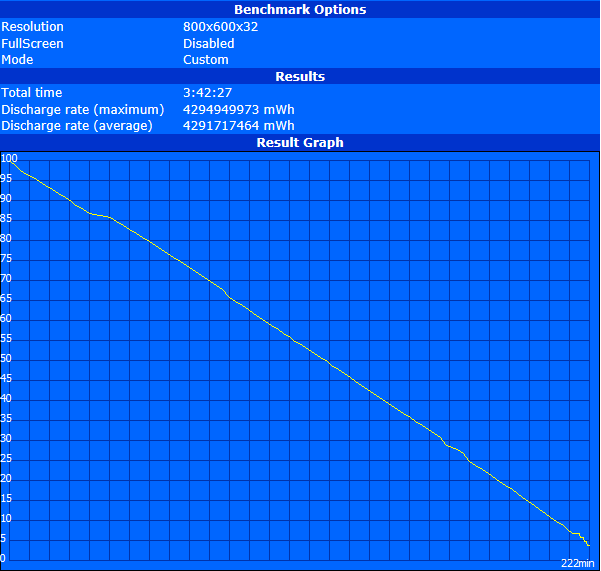 Typical applications that benefit from these optimizations are represented by SPECviewperf.12. 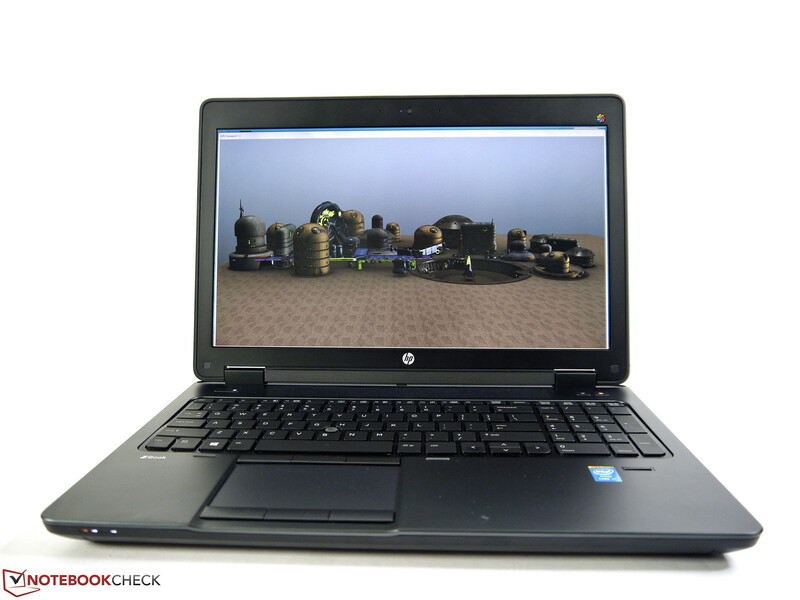 It covers scenarios like CAD, 3D design, 3D visualization, oil & gas exploration and a medical MRT. As usual, this benchmark is just an indicator for the possible performance in specific scenarios. The actual software, the used application version, the installed drivers and many more influences can change the real-world performance significantly. The comparison with other AMD chips shows that the AMD FirePro M5100 is – as expected – faster than the AMD FirePro W4170M inside the Dell Precision M2800. The only exception is ProEngineer; otherwise, the differences are usually between 10 and 20%. Compared to the rivals from Nvidia, the AMD FirePro M5100 is pretty good as well and can surpass the direct rivals Nvidia Quadro K1100M and Quadro K2100M in all tests except for ProEngineer, TCVIS and CATIA. 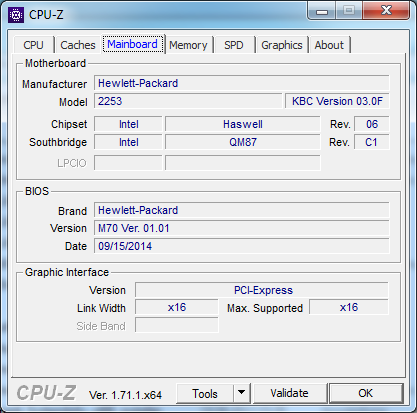 A surprise is the new Maxwell chips in SPECviewper.12. Contrary to previous generations, the Nvidia GeForce GTX 970M and GTX 980M manage a huge performance increase in the professional tests. 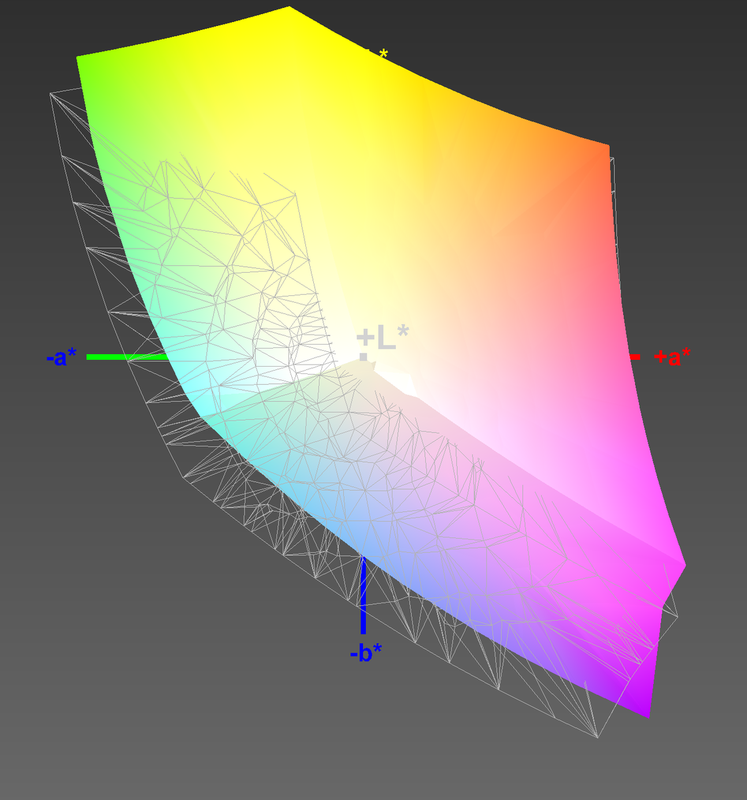 They even beat the high-end Quadro K5100M in Maya, the medical MRT, SolidWorks and the Energy test. However, the result is not really surprising in Showcase. 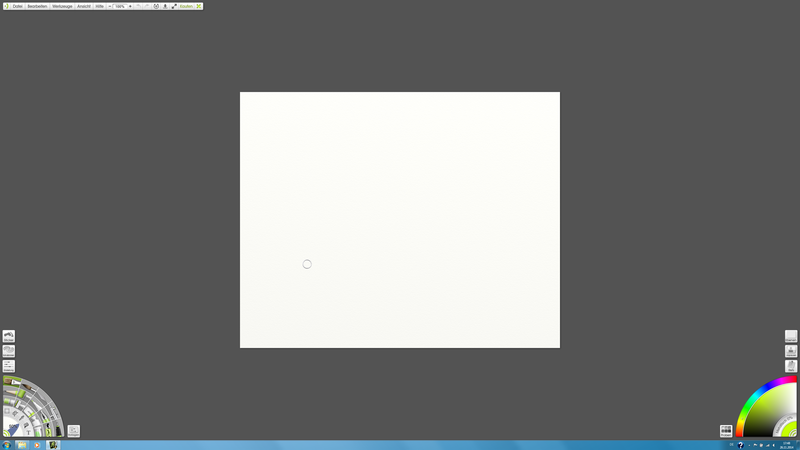 It is a DirectX test, so it represents the raw performance. More scenarios where graphics chips become increasingly popular are financial analysis, complex light and shadow calculations (ray tracing), cryptography, picture and video editing as well as video conversions. AMD's solution can score in many of these areas and sometimes manage a clear lead over the Quadro rivals. Only the cryptography result of our review model is surprisingly bad for an AMD GPU. Even repeated runs didn't improve the result. AMD GPUs still cannot really compete with Intel's Quick Sync video (only usable with the activated Intel HD Graphics), which is the leading technology when you want to convert different video formats. You can still benefit from a clear CPU relief with AMD's APP technology and therefore use the workstation for other tasks during the conversion process. Since they usually use the more powerful hardware, AMD's professional graphics solutions traditionally perform very well with DirectX applications that are dominant when you leave the professional environment. 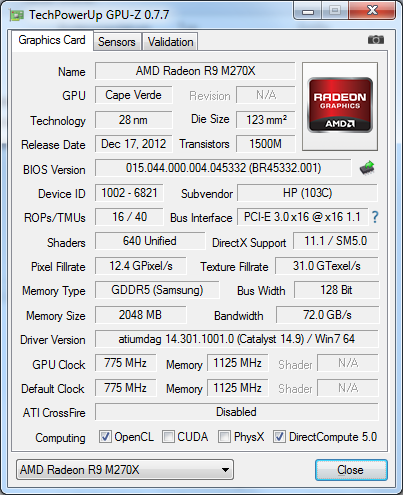 The performance is roughly on a level with the AMD Radeon HD 8870M. The direct rivals Nvidia Quadro K1100M and Quadro K2100M can easily be surpassed in the 3DMark (2013) GPU score. This also applies for the tessellation performance in the Unigine Heaven 3.0 benchmark, where you need at least an Nvidia Quadro K3100M to beat the AMD FirePro M5100. Neither the operation on battery power nor under continuous maximum load resulted in a reduced clock according to the hardware tools. Cinebench R11.5 OpenGL Shading shows 68 fps on battery power instead of 70 fps, so the result is almost identical. Even though the professional GPUs are not designed for gaming, they can still be used to play games. The performance is usually similar to the consumer counterparts since the DirectX capabilities are not affected. This means mobile workstations are usually sufficient for the occasional game. However, not even the top versions can replace a real gaming chip. The performance of the AMD FirePro M5100 is sufficient for high and sometimes the highest settings in our tested titles. Only Company of Heroes 2 required some quality reductions. We also tried some titles with a higher resolution (2048x1538 pixels) and medium details. While GRID Autosport and World of Warcraft ran pretty well with these settings, the result was borderline in Hitman: Absolution and Metro Last Light. However, you should be able to play these titles smoothly when you reduce the effects a bit. The device is almost exemplary in terms of noise development. You can only hear the quiet sound of the hard drive motor with 29.2 dB(A) during light workloads, and this could be easily changed with a Solid State Drive. The cooling solution is also pretty restrained with medium workloads and reaches a system noise of 36.8 dB(A). Maximum load finally resulted in 41.2 dB(A). The fan control is very convenient at these higher stages. Short peak load usually doesn't lead to an immediate rpm increase. Instead, the fans will only spin faster after a couple of minutes. The fan control is quicker after the load is reduced and quickly decreases the fan speed again. We did not notice inconvenient or high-frequency noises from our review unit. The case surface reaches up to 45.7 °C at the left bottom after continuous load for 120 minutes. This is the area around the fan exhaust, where the heat from the other case areas is dissipated. The maximum temperature is lower at the top with up to 38.3 °C. Those values are not critical for a workstation, especially if you plan to use the notebook as a stationary device on a desk. However, we could measure a pretty critical 62.2 °C at the fan exhaust itself. This can be uncomfortable for the hand if you accidentally touch this spot. Otherwise, there shouldn't be any restrictions. As we already mentioned in the Performance section, both the CPU and GPU can maintain their performance even after 120 minutes. (±) The average temperature for the upper side under maximal load is 34.3 °C / 94 F, compared to the average of 31.1 °C / 88 F for the devices in the class Workstation. (±) The maximum temperature on the upper side is 43.5 °C / 110 F, compared to the average of 37.1 °C / 99 F, ranging from 23 to 69.8 °C for the class Workstation. (-) The average temperature of the palmrest area of similar devices was 27.8 °C / 82 F (-6.9 °C / -12.5 F). A large part of the power consumption of the HP ZBook 15 with DreamColor display was caused by the screen. Even the minimum consumption was at 20 Watts, where more than 9 Watts (minimum brightness) were consumed by the display. The current review unit with a QHD+ display has a much smaller effect with around 2 Watts (minimum brightness) at a minimum overall consumption of 11.3 Watts. This value is higher with the high-performance energy profile at 15.5 Watts with all wireless modules activated and the maximum display brightness. 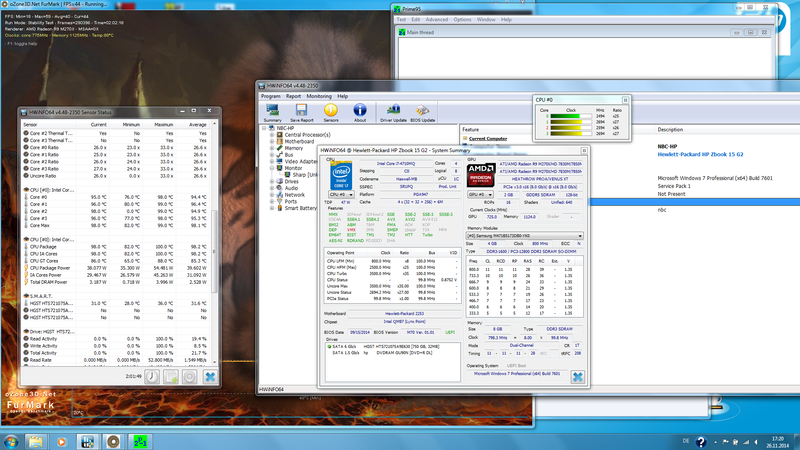 We measured 78.9 Watts with medium workloads and almost 130 Watts under maximum load for the CPU and GPU. The power adaptor has a nominal output of 150 Watts and therefore sufficient headroom. 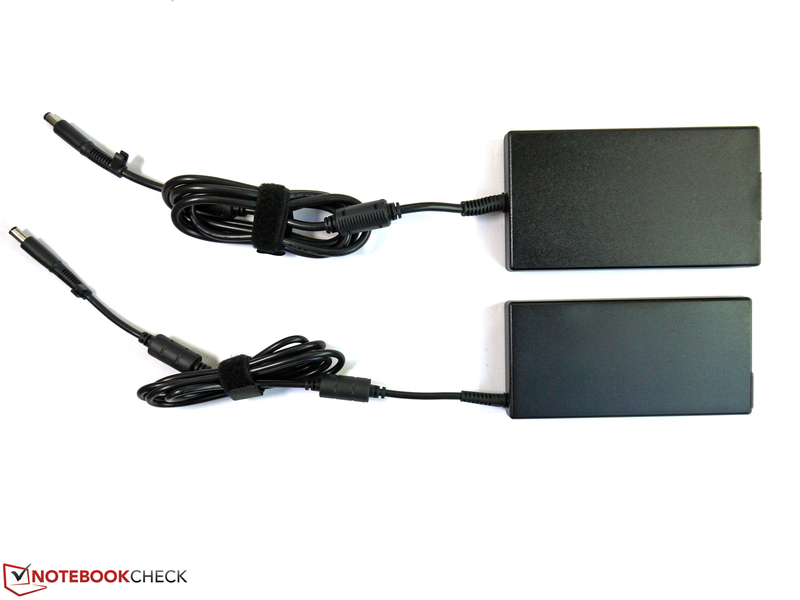 More powerful configurations of the ZBook 17 are shipped with a 200 Watts power adaptor. 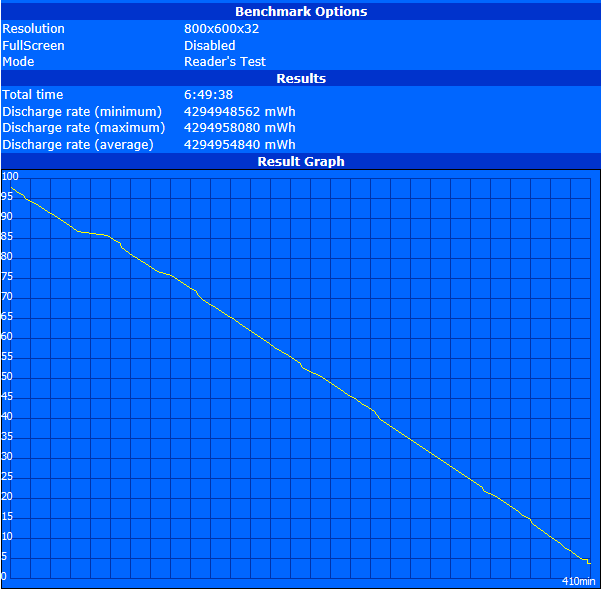 Similar to the DreamColor configuration, the current ZBook 15 G2 also has a 75 Wh battery that is designed for longevity. There is also the optional more powerful 83 Wh battery with a normal lifespan. 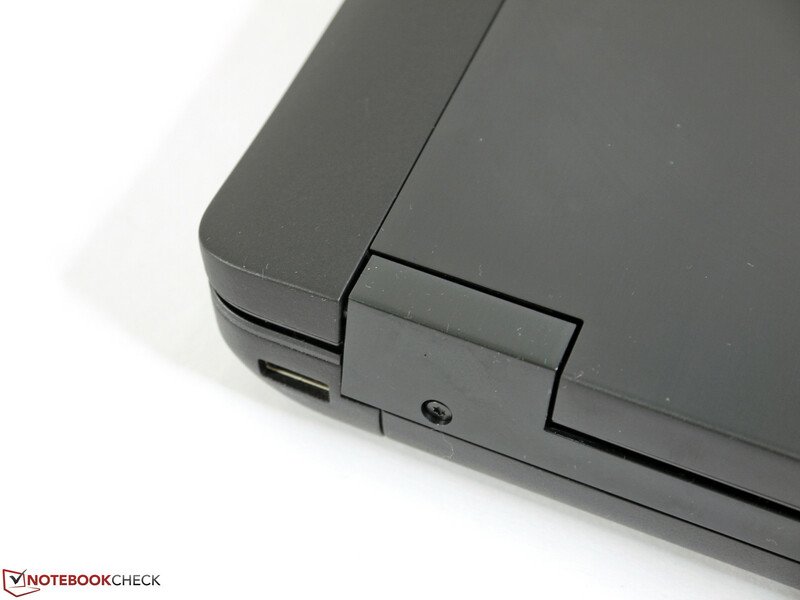 A special feature of the ZBook-series is the external batteries that can be attached at the bottom of the device. They complement the standard battery as a secondary battery and can increase the runtimes significantly. They obviously increase the weight as well, but this is not the most important aspect for this device and performance class. 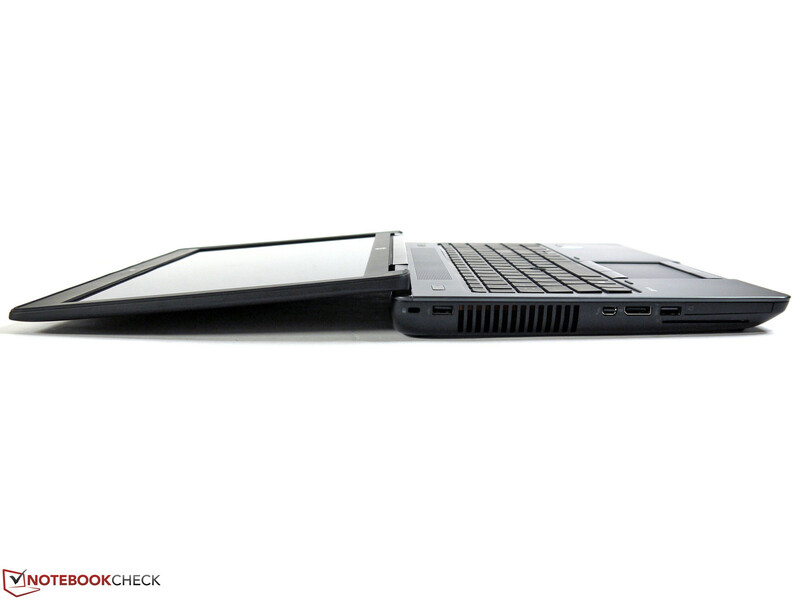 You can choose between the HP ST09 Extended Life notebook battery with 73 Wh and the HP BB09 notebook battery for very long battery runtimes with a capacity of 100 Wh. The prices for both batteries are currently around 160 Euros (~$198). Even the "smaller" 73 Wh battery manages respectable battery runtimes, which should reach around 4 hours during "normal" use. 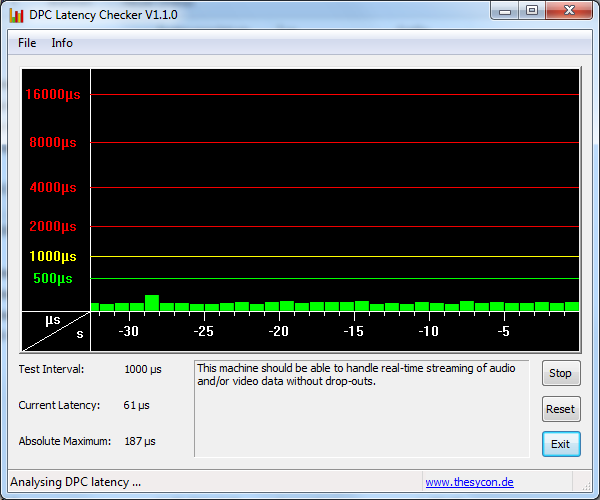 We performed the WLAN and Video test with the energy-saving mode and a display brightness of 150 cd/m² (setting 16). 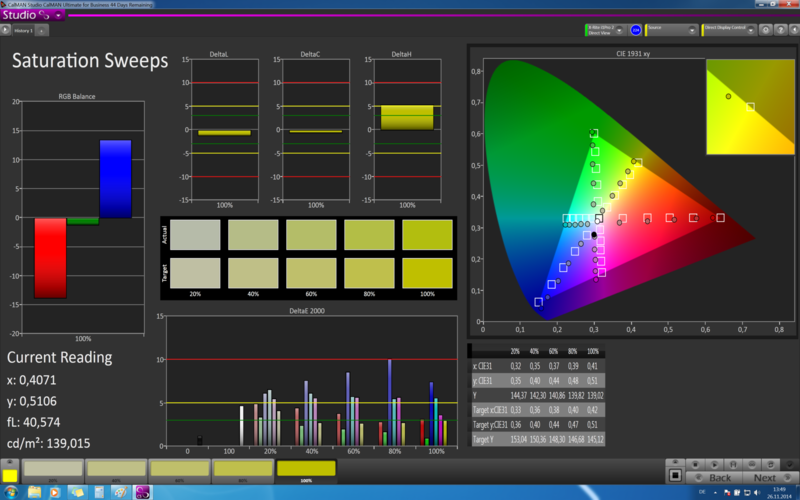 Compared to the configuration with the DreamColor display, we can see twice the runtimes. The main task of this device class, however, will drain the battery very quickly. We used the SPECviewperf.11 (maximum display brightness, all wireless modules active, high-performance profile) to simulate this scenario and ran it until the device shut down. The result was a bit more than one hour. 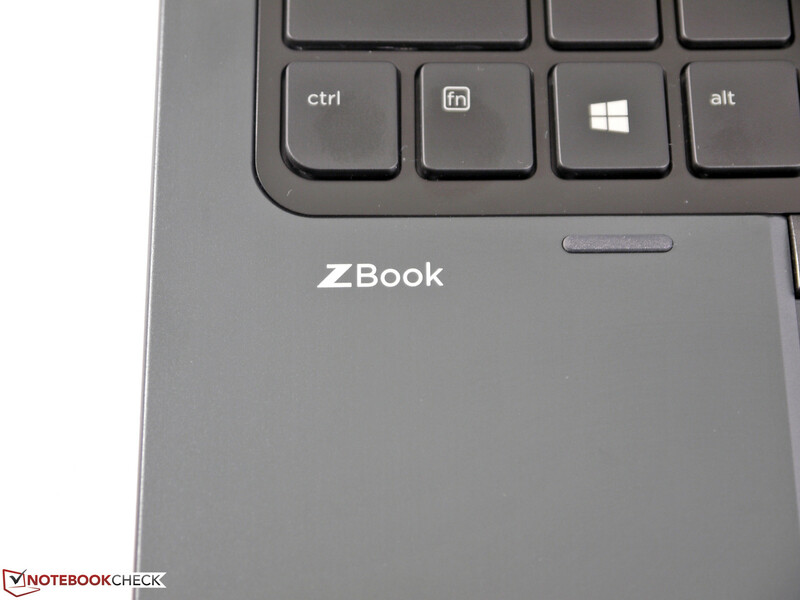 HP introduced some interesting new features for the ZBook 15 with the addition G2. While the case, the ports, the input devices and the good expandability didn't require any changes, the new configuration options are nice additions for the targeted customers. The very good QHD+ display is pretty much on a level with the Full HD IPS panel in terms of specifications, but obviously it has the advantage of the much higher resolution. 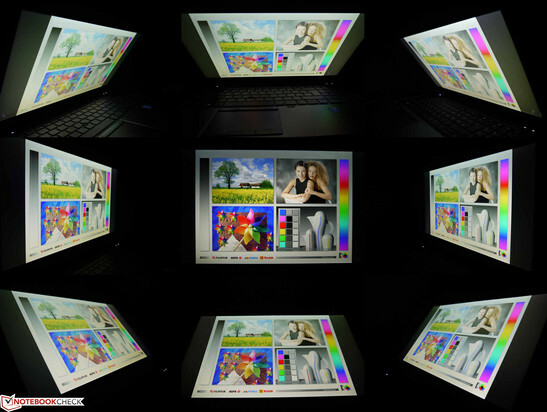 Color accuracy, contrast, viewing-angle stability and brightness are without a doubt very good for a notebook and should be sufficient for many professional tasks. 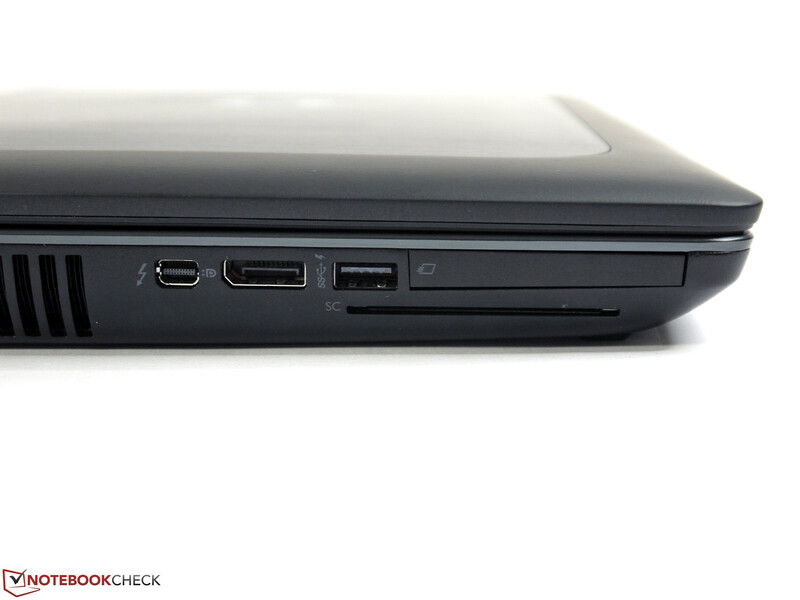 The second core element of this review is the attractively-priced AMD FirePro M5100 GPU. This solution does not have to hide behind the alternatives from Nvidia, despite the price differences. Quite the contrary: It usually performs very well and is only beaten by the direct rivals in some tasks. 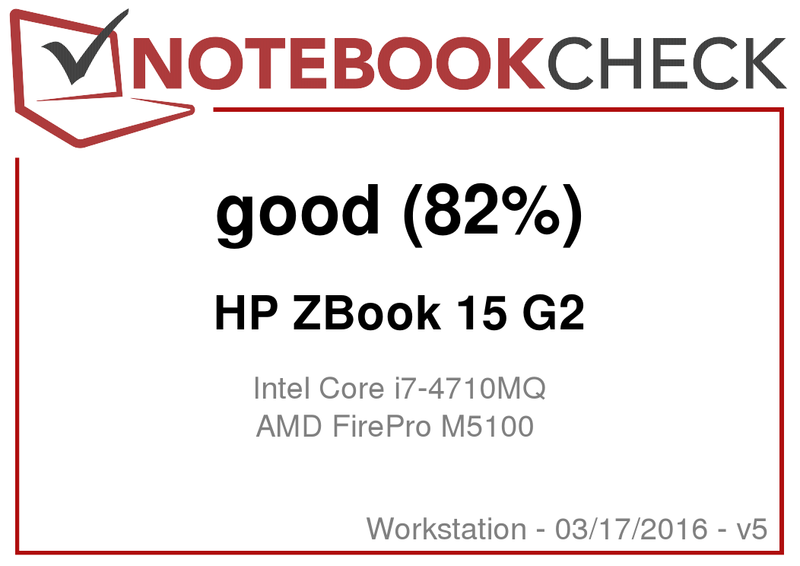 HP did not change the convenient cooling concept of the ZBook 15, which is only noticeable if you need the corresponding performance. This means the emissions are moderate in every situation and should meet almost all expectations. The only aspect that leaves mixed impressions is the current pricing concept, especially in the online configurator. Considering the pre-configured systems, there are some additional charges that are just not comprehensible, and they could almost be called horrendous in comparison with the competition. We were not able to clarify if there was a mistake with the pricing before we hit the deadline for this review. 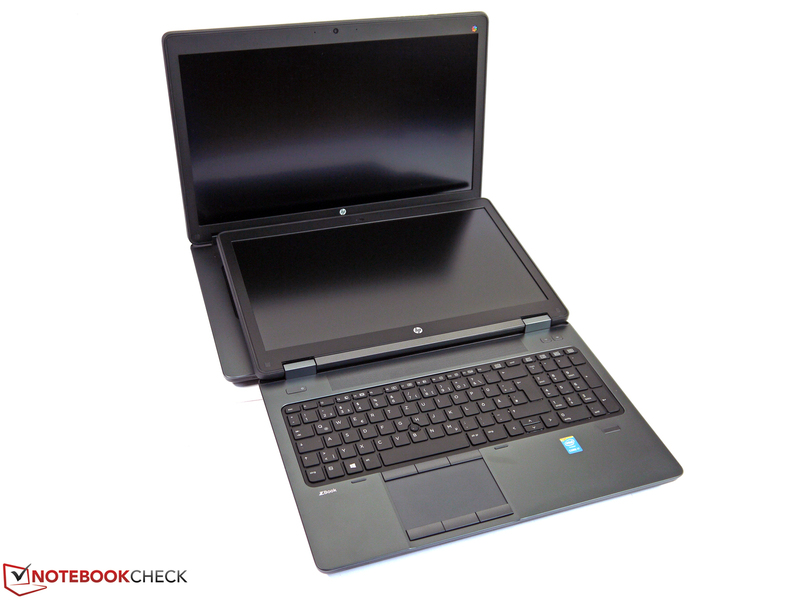 In review: HP ZBook 15 G2. 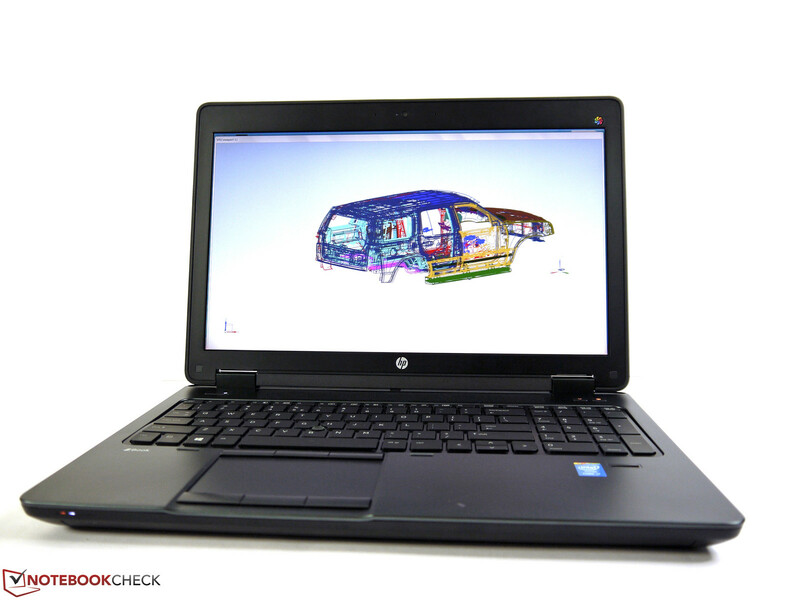 Test model courtesy of HP Germany. Important elements did not change and represent the convenient basis. This includes the case, input devices, ports as well as the exemplary expandability. ...which is apparent when you look at the dimensions and the weight. ...and a powerful cooling solution. ...and can also be expanded by a docking station. ...and every user should find the right panel. Very interesting is the wide gamut DreamColor display and the reviewed QHD+ display. 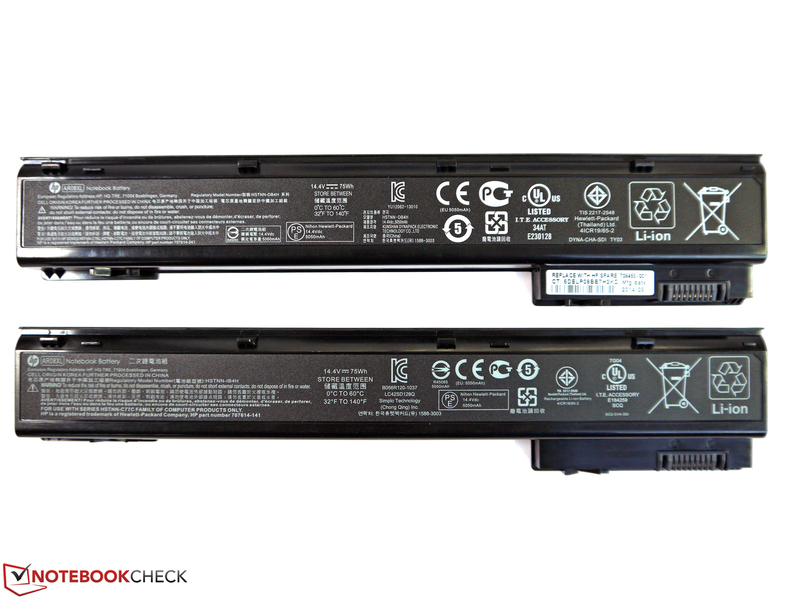 The batteries of the ZBook 15 and 17 are almost identical and are exchangeable. External displays can be attached via DisplayPort, Thunderbolt 2 (MiniDP) or VGA. 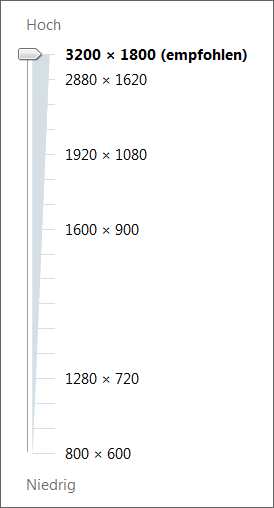 DisplayPort 1.2 supports external displays with up to 4096x2160 pixels. 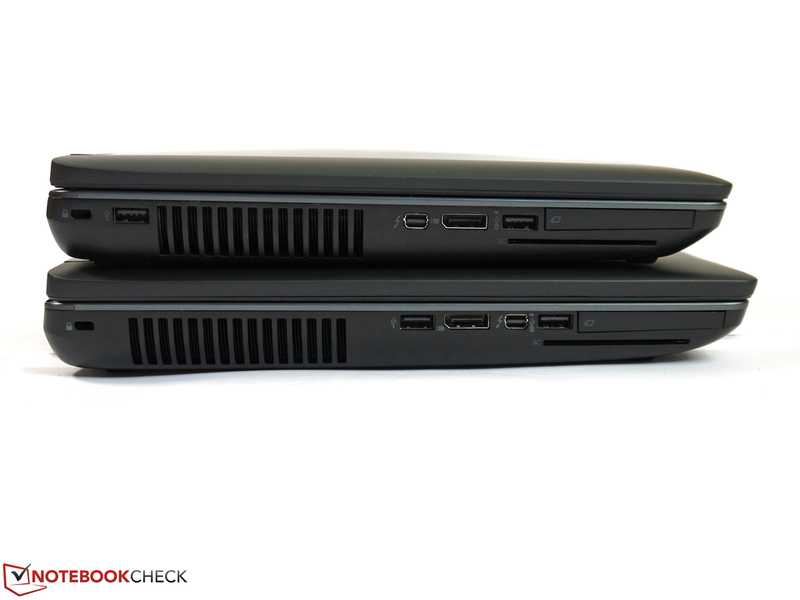 The size difference between the HP ZBook 15 and ZBook 17 is pretty moderate. ...if you look at the expandability. Thanks to the better cooling solution, the bigger version can handle more powerful components. 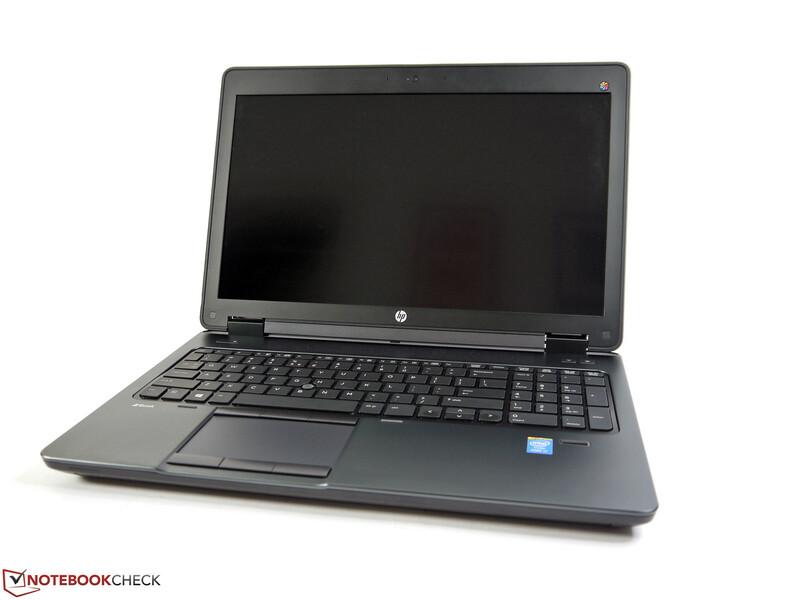 But the HP ZBook 15 G2 is already very fast and should be sufficient for many tasks. 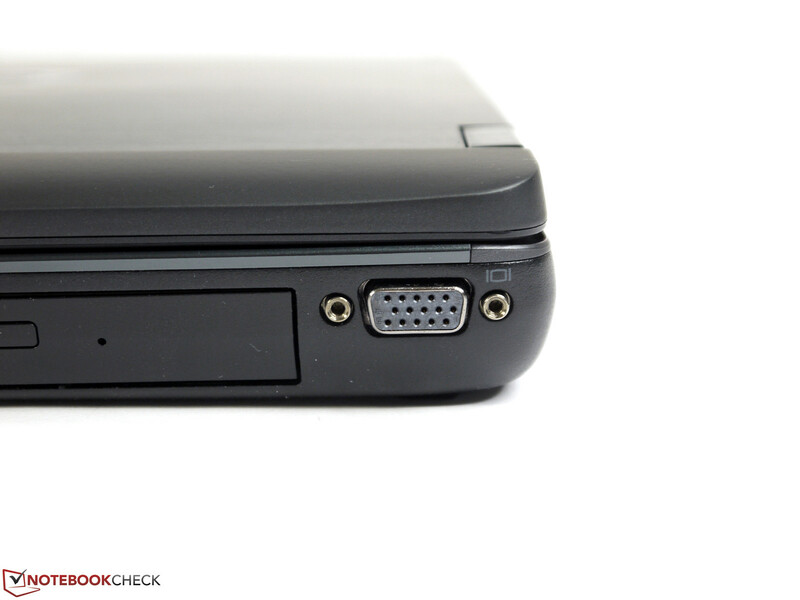 While the port layout differs, the ports themselves are pretty much identical. The choice basically comes down to your personal needs and the available components. A QHD+ panel, for example, is not available for the 17-inch version. 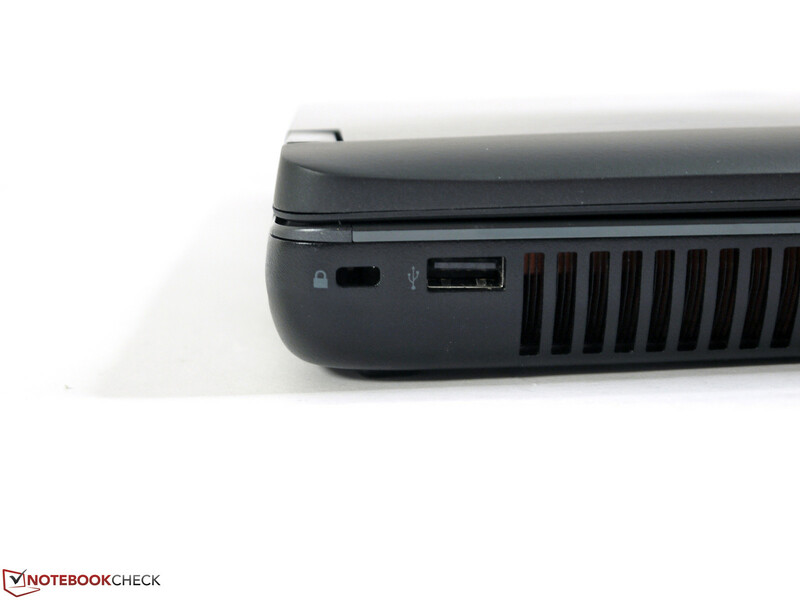 Most configuration of the HP ZBook 15 G2 use the smaller 150-Watts power adaptor. That HP now integrates previously missing features and now offers very comprehensive configuration options. There should be a suitable system for every scenario. We obviously also still like the case, the input devices and the exemplary expandability. Great. More practice-oriented standard configurations, a more comprehensible price structure in the online store and additional prices for storage and memory options that are in line with the market. 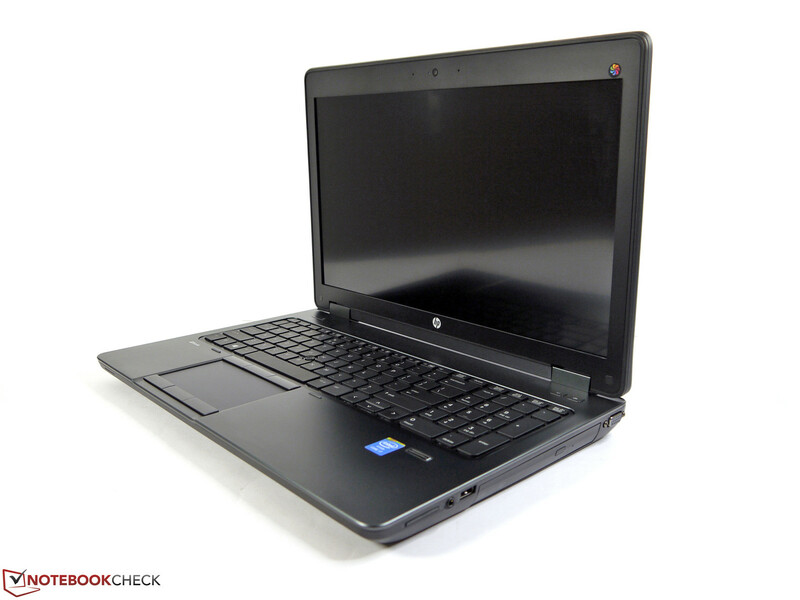 That HP only now offers a high-resolution display and AMD's FirePro M5100.